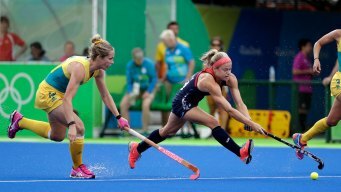 The United States' women's field hockey team remained unbeaten in Rio on Thursday, defeating India, 3-0, in a Pool B matchup. Katie Bam led the way for the U.S., as usual, scoring two goals. Katie Bam has been with the U.S. national team for over a decade and is one of the top goal scoring threats for Team USA. In her Olympic debut in 2012, she scored one goal. Team USA stayed perfect in women's field hockey pool play with 6-1 rout of Japan and took over the top spot in the Pool B standings. Katie Bam collected a hat trick as the U.S.
After finishing last in the 2012 London Games, U.S. women open 2016 Rio Olympics with win over Argentina. In its first game of pool play, Team USA came up with a huge 2-1 win over medal-winning favorite Argentina.